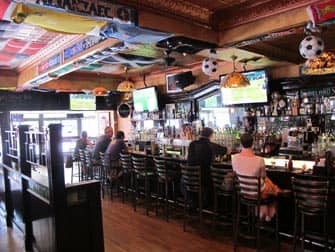 Where are the best bars to watch football in New York? Watching football in New York might seem impossible since it’s the country of baseball and American football, but New York has it all including bars dedicated to football. Sports fans don’t have to miss out on watching the games while on holiday. 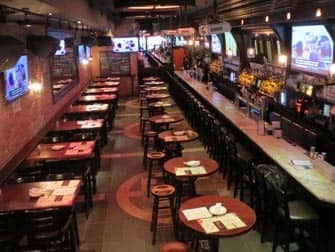 I’ve made a list of sports bars where you can enjoy watching the games in New York. Legends is a sports bar that has people, places and New York legends as its main focus. The place has a casual atmosphere and combines simple but good food with a football match. 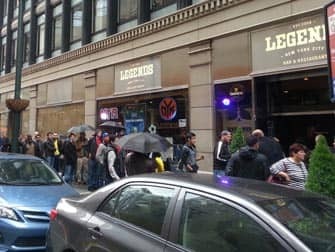 Legends loves football fans so much it opened a space completely dedicated to football, called The Football Factory (using the international name of the game, instead of the American name soccer). They screen many championships like Champions League, Bundesliga and La Liga. There are 3 floors with 50 tv’s and 2 huge screens for your entertainment. You’ll find it all in a perfect location: in front of the Empire State Building. 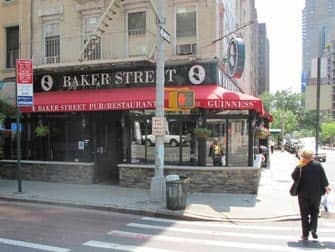 Baker Street is an Irish pub named after the famous English street. You can watch various sports in this place, including football. Check their calendar for upcoming events and the games they’ll be showing. Besides watching sports games, you can also get a drink or grab a bite. Lunch starts at 11:00 during the week and from 11:00 to 16:30 they serve a traditional brunch on weekends. It’s $15 for a main course (such as an omelet or burger) and 2 drinks (wine, beer, champagne, juices, coffee or tea). Tonic Bar with its 35 HD Screens, seems to be inspired by its location on Times Square. It’s a sports bar broadcasting several sports, also the AFL matches. If you want to be sure the football match you’re dying to see will be shown, it’s a good idea to call them in advance. Tonic Bar has 2 floors and serves lunch, dinner and brunch (on weekends). Happy hour is Monday to Friday from 16:00 to 20:00 and you can even head to Tonic for some karaoke. I recommend watching a game while feasting on chicken wings with ranch dressing and trying one of the 30 beers on tap. This bar is a good spot to watch the Super Bowl. The Super Bowl kickoff is at approximately 18:30. Be there already in the early afternoon as it will get crowded. 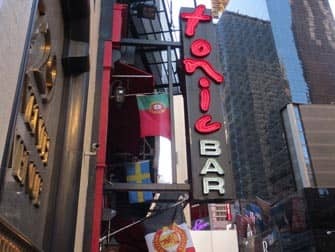 Tonic is also the place to be for watching other sporting events in New York, such as the World Cup. Smithfield Hall is located a few blocks from Madison Square Garden. They broadcast football matches from all over the world. Customers here are mostly local New Yorkers looking to watch an American or international football match while enjoying a beer. And football is not the only sport that you can watch here, they also show NFL, MLB, NBA and rugby matches among others. 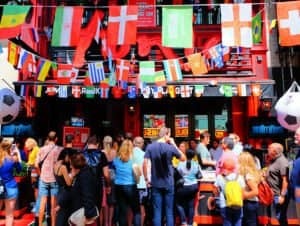 If you don’t want to miss out on any games played back home whilst in New York, visit The Australian NYC located in Midtown Manhattan. 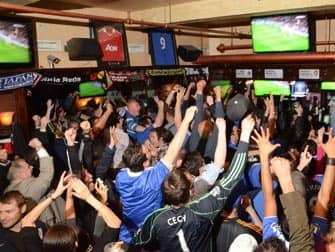 It’s a restaurant and bar which acts as a hub for Australian activity in New York, and they really love their sports! Twenty large screens show various sports; from AFL, rugby, cricket and soccer. They also show US professional and college sports; NFL, MLB, NBA, NHL, NCAA and more. Missing the taste of home? Enjoy some Aussie foods here as well.